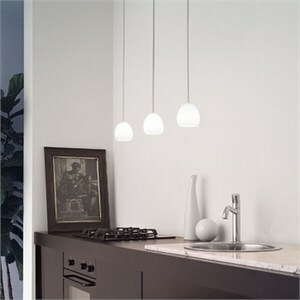 Whimsical, line-voltage pendant available in several colors. Handblown, satin diffuser provides downward and diffused illumination. Companion wall, ceiling, table and floor lamps also available. 1 x 50 watts, halogen, MR16. Canopy and stem: Black or titanium. Satin Red, Satin Blue, Satin Amber, Satin White.